Mirchi ka kutta is not a recipe I grew up eating but I had tasted it once in a while cooked by a friend's mother. 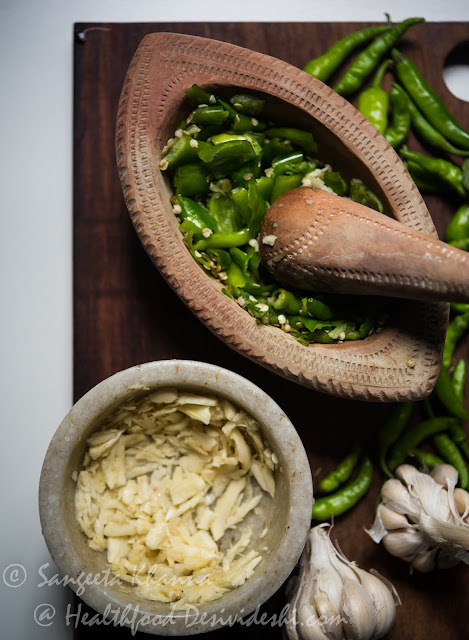 Back then I was not so enamored by chilies, anything made with just chillies had to be in small servings and it was used just like a spot of heat on the platter. The kind of relish that was put to use only when the food was bland otherwise. And then I tasted this mirchi ka kutta that blew my mind away. I loved that it was made from the less hot Rajasthani chillies and that it had loads of methi (fenugreek) seeds. I know the picture that comes to mind is a bitter and hot relish but this mirchi ka kutta is far from that. As I mentioned in the last post about Kiradu temple complex, the sattvic meal we enjoyed there had this mirchi ka kutta as a side dish and I loved it so much that I took 3 helpings and the last time I asked for a bigger serving so I can enjoy it without worrying for refills. It was really that good. I called Chef Megh Singh Rathore immediately and asked for the recipe. He rattled a simple recipe and I memorized while polishing the last bits of mirchi ka kutta with soft pooris. 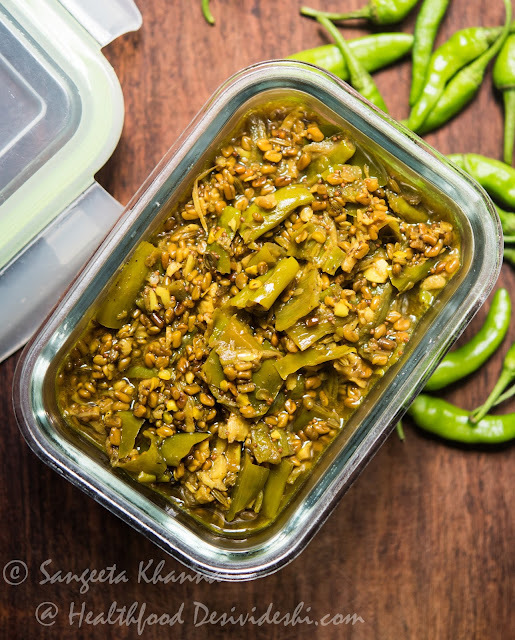 Apart from loads of methi, this mirchi ka kutta has some sounf (fennel seeds) and some rai (small mustard seeds), some crushed garlic and a little lashing of hing (asafoetida). All this is balanced off with a sprinkling of amchoor powder. The only similar recipe that I am reminded from my home is a mirch ki kalonji that my grandmother used to make in bulk and refrigerate for the whole week. One mirch ki kalonji used to land up on everyone's plate at meal time. I need to recreate that too very soon. Let it be mirchi ka kutta till then. Pound the garlic and chillies separately. It helps if you chop the chillies before pounding them in a mortar and pestle. Be careful of any seeds that may decide to fly and land in your eyes while pounding. Heat the oil and tip in the hing first. Let it sizzle and then add the methi seeds followed by sounf and rai. Add the garlic when the seeds start getting aromatic. Mix and cook for a couple of seconds. Add the chillies, salt and mix well. Cook for a minute and add the water. Cook covered on low for 10 minutes. Add the amchoor powder and cook again for a couple of minutes, adding a little more water if required. The mirchi ka kutta will be moist enough so that the methi seeds swell up after soaking the juices. Empty the contents into a clean jar or container and refrigerate immediately. It keeps well for a week easily. 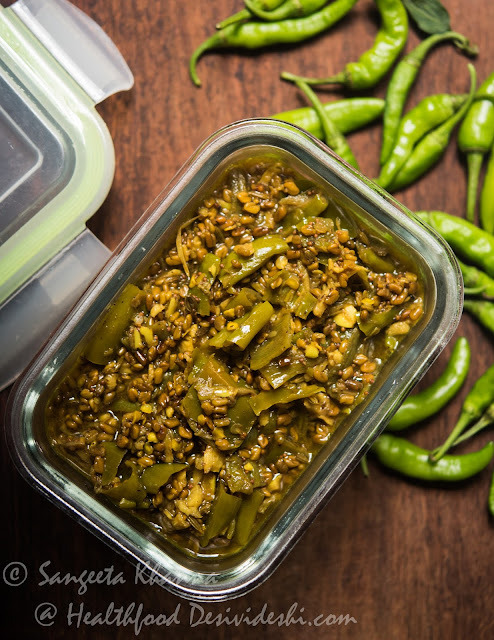 This mirchi ka kutta goes really well with poori and paratha but I love it with khichdi and dal chawal meals too. You can serve it with practically everything, all kind of Indian meals. 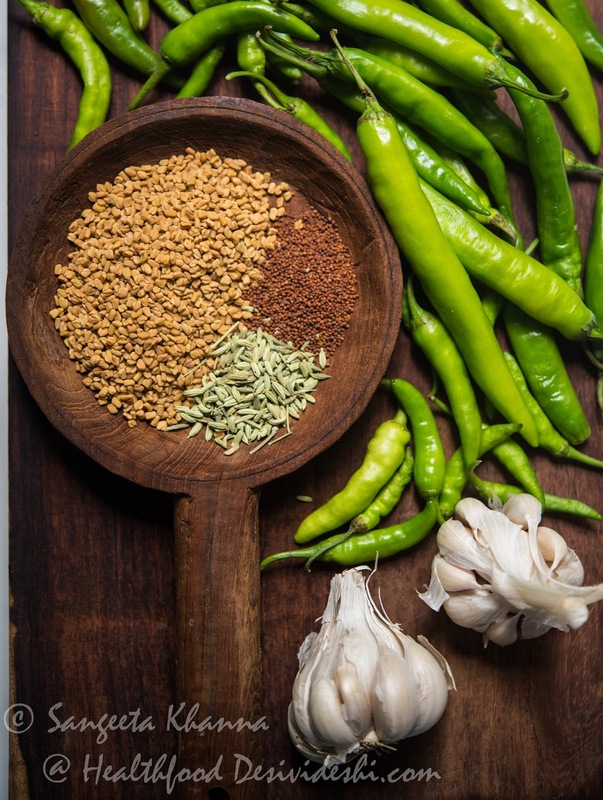 It is an interesting amalgamation of flavours ranging from bitterness from methi, aromatic sweetness from fennel, sharp punch of garlic and the flavourful heat of green chillies, everything wrapped up by the tartness of amchoor powder. All strong flavours meld so well you crave for more. Will try this sometime. Do u have a sattu filling recipe? Delighted to find sattu stuff filling paratha too: http://www.banaraskakhana.com/2009/08/sattu-ka-paratha.html?m=1 Thanks!! ha ha glad you found it ultimately. Thank you.